Artistically Speaking: November is Art Every Day Month! I am taking a stab at it. It's good to have a push to set everything else aside for a little while each day and just make something, otherwise I get sucked into work projects and the days go by and soon I feel as though my creativity has dried up to a sad little pit somewhere deep inside. And that's bad. So this month I have a reason to be guilty if I don't make some art. To start out, I'm working on a new paper clay doll. She is a travelin' gal, getting all set to make a long trip to visit friends in a foreign land. But first she really needs some clothes! Her body parts were sculpted a couple days ago. 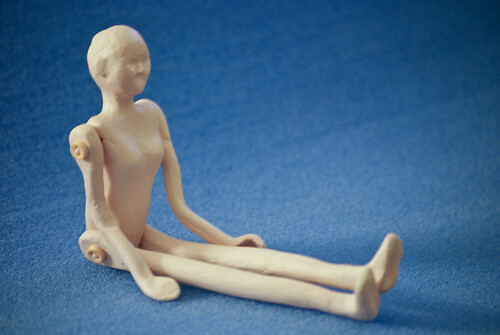 I am still new to the jointed doll creation and I did not get the joint points quite right, so she's a little awkward. And she has very skinny arms and legs, but we really shouldn't judge. Yesterday I painted them all pink and strung her together with thin elastic cord. This evening she got a face. The mouth is the hardest, since I did not model her lips into the clay. I like the smile she ended up with though, she looks cheerful. She also got some bright orange hair, needle-felted out of wool and glued to her head. And a heart.